Advanced open water diver certification in Spain with the Best! Advanced Open water Diver certification. Advanced Course. If you are already the holder of a PADI Open Water Diver certification, then you’re ready for the next leap in terms of education & experience. With 5 additional diving Specialties to learn, you will be able to enjoy further & understand more about how you interact with the aquatic environment. 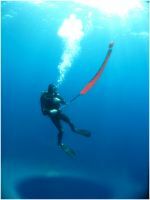 More confidence through understanding & practice equals better buoyancy & more relaxed diving which will also help you to better your air consumption & become a better more confident diver!